The former art studio-turned-cafe is one of Norfolk’s hidden gems. The walls of the funky coffee shop are lined with works by local artists while whimsical top hats hang from the cafe’s ceiling. Starving Artist serves art-inspired omelets, burritos and more for breakfast and lunch six days a week, making it the perfect meeting spot for a social morning coffee or afternoon meeting of the minds. The Swan Terrace is an upscale American grill specializing in fresh, locally sourced cuisine with a dash of Southern sophistication. The restaurant offers both indoor and outdoor seating options and a handful of signature eats including appetizers, meat-centered entrees, desserts and an all-you-can-eat lunch buffet complete with a salad bar, fresh fruits, cheese selections, freshly baked breads, soups and hot plates. The restaurant is also ideal for closing business deals and for business dinners as well. With nearly 30 years of experience in the catering industry and seven locations across Coastal Virginia, Gourmet Gang is the go-to place for handcrafted eats. All of Gourmet Gang’s bistro-style sandwiches, salads, hot entrees, desserts and signature boxed lunches can be delivered straight to your home, office space or corporate event. 219 pairs elegance with tradition in its homey, Downtown Norfolk dining room. The bistro’s weeknight happy hour offers great rotating discounts on beer, wine and handcrafted cocktails. Several of the restaurant’s American-style dishes are featured as happy hour specials as well, including discounted lobster tails every Monday night. The Founders Inn and Spa is celebrated for its sophisticated cuisine, world-class conference spaces and luxury accommodations. The inn’s hospitality team strives to provide excellence to all resort visitors from weekend vacationers to international business executives. Look to The Founders Inn and Spa’s top-notch services and accommodations, from corporate event catering and event planning to hosting guests for business travel or meetings and conferences. The sprawling greens of the par-69 golf course are nestled among the picturesque homes of Virginia Beach’s Birdneck neighborhood and offer stunning views of the sparkling Linkhorn Bay. After completing 18 holes beneath the Cavalier’s towering pines, golf course guests can cool off with an afternoon beer in The Banks Grill or enjoy a casual dinner on the outdoor Redan Deck complete with firepits and soft seating. Topgolf’s private bays are ideal for social outings. Each climate-controlled bay is equipped with individual flat screen TVs and communal seating perfect for cocktails, bar bites and teambuilding exercises. For larger parties, Topgolf offers special meeting spaces and packages ranging from the conference room and lower level lounge to the private, rooftop terrace and full venue buyout. Harbor Park is more than just a baseball venue. The Norfolk stadium boasts baseline seats and luxury skyboxes for high-profile guests as well as a full-service restaurant, Hits at the Park, that overlooks the entire field. Clients can also imbibe local beers on the stadium’s O’Connor Brewing Co. Party Deck and watch the Friday night fireworks extravaganza. BizConnect Hampton Roads helps small businesses and entrepreneurs grow their personal brands, increase their local presence and improve networking skills by hosting professional networking series across Norfolk and Virginia Beach. BizConnect groups foster quality relationships between business men and women from all fields and help one another obtain referrals, develop their skills and boost their brand. tHRive strives to give a voice to the outstanding young professionals of Coastal Virginia. The professional networking group allows members to work together to promote regional awareness and further develop the future of their respective communities. tHRive hosts both monthly meetings and signature annual events for current and prospective members. The Regent University School of Business & Leadership is tailored for today’s professionals and entrepreneurs and teaches practical skills with both biblical and global perspectives for its students to implement immediately in the workplace. Regent’s business school offers several business degrees, including its Master of Business Administration, which offers career development skills with classes available online and on campus on a full-time or part-time basis. 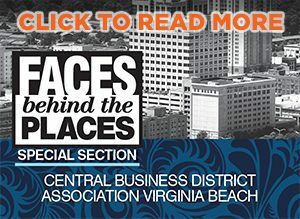 A program of the Hampton Roads Chamber, LEAD Hampton Roads identifies, educates and supports leaders dedicated to the region through programs, events and community projects. LEAD Hampton Roads has developed leaders for 30 years and has a network of over 1,500 graduates representing private, public and nonprofit sectors that are committed to implementing positive changes to the region. The Academy for Nonprofit Excellence provides course topics on nonprofit management and leadership, and develops its content for practical application. Those that join this professional development program at Tidewater Community College can expect to expand their skills and knowledge to increase effectiveness, build capacity and enhance the mission of their nonprofit organization.